The comic ‘I’ and the tragic ‘we’? Shakespeare writes Comedies in which characters, sometimes quite perversely, find the wrong way to the ones they love. Often it is chance or an onstage helper who sorts this out. Shakespeare is actually quite reserved when it comes to showing love as naturally progressing through its obstacles unassisted. But given that in the initial stages of courtship Shakespearean lovers almost never meet and join in a perfectly symmetrical way—they don’t start out as stones set in an arch, leaning perfectly on a keystone—we should expect this asymmetry to show itself in the language. Where does it show up? It appears when a resistant individual, a “you,” prevents another “I” from arriving at an interpretation of a relationship that might be referred to as a “we” before others. Let’s call this the “resistant-you” hypothesis. Linguistically, the effect manifests itself in the assertion of the self (“FirstPerson”) and the rejection of suggested mental and emotional realities (“DenyDisclaim”). We’ve been finding that high frequencies of first person pronouns, and other features associated with rapid dialogue, are characteristic of most types of Early Modern comedy. But what of the implied correlative to this? If comedies are the genre of ‘I’; are tragedies the genre of ‘we’? A quick way to test this is to use Martin Mueller et al.’s excellent Wordhoard tool to run a log likelihood vocabulary test on Shakespeare’s comedies and tragedies. 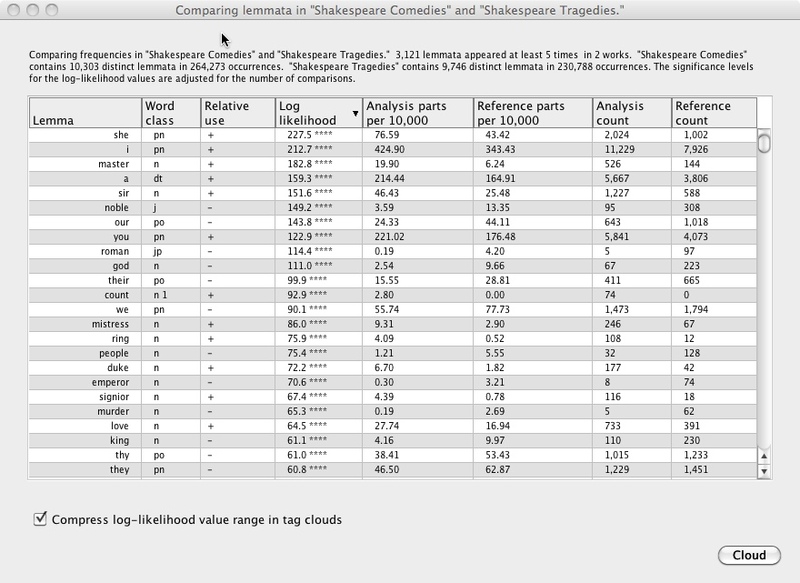 This type of test takes an analysis corpus (in this case Shakespeare’s comedies), and compares it to a reference corpus (Shakespeare’s tragedies). The output flags those words that are either more or less frequent in the analysis corpus than we would expect, given the frequencies found in the reference corpus. Behold: pronouns used more in the comedies than the tragedies are the singular ‘she’, ‘I’, ‘you’ (let’s assume these are mainly singular uses) – these are all marked + in column 3. Now look at the results for the plural pronouns ‘our’, ‘we’, ‘they’: all marked -, and so lowered in the comedies/raised in the tragedies. This is a very strong finding (especially considering how frequent pronouns are), and it invites further exploration of the dialogic nature of comedy in comparison with the communal nature of tragedy. This entry was posted in Early Modern Drama, Shakespeare and tagged comedies, I, log likelihood, pronouns, tragedies, Twelfth Night, we, Wordhoard, you. Bookmark the permalink. Post a comment or leave a trackback: Trackback URL. I was intrigued by the notion that plots might leave a linguistic signature of the progress towards a particular climax and wrote a program to test this idea with I/you/we groups on a set of early modern plays from the TCP-EEBO corpus. The preliminary results can be seen here and seem to confirm that such intra-textual progression can be traced as an indicator of genre.